David: As far as Republicans are concerned, government isn't broken at all. They are getting exactly what they want from it; low taxes on the rich, and no regulation of the big money players on Wall St.
Others suggested greed was the culprit for the demise of the U.S. political system. Jan: Big businesses focus on greed instead of fair profits and investing in a company and its employees is an enormous part of why the middle class is in the position we are in today. No one, and I mean no one, needs the amount of money being given to companies top tier executives instead of investing back into the company and its employees. Greed defined as “excessive desire to acquire or possess more (especially more material wealth) than one needs or deserves avarice: reprehensible acquisitiveness; insatiable desire for wealth (personified as one of the deadly sins) has brought down civilizations in past history and unless we change this I fear for the future of America. What happened to being proud of your accomplishments instead of being greedy individuals who take the money at the cost of their employees? The people whose money they are running away with instead of help building Americas future and a stronger middle class. Companies need to invest in the employees who do the work. Mark: The American Dream is alive and doing well–in India, and at a huge discount. Our, nay, The Government is not broken, they are right on schedule in selling out the middle class. Dan: Fix middle class problems, fix broken government – GET RID OF LOBBIEST, SET TERMS LIMITS FOR POLITICANS, We now have a new class system and the middle class does not fit anymore. Two American missionaries are still behind bars in Haiti today. Eight others are now free and back in the U.S. They all deny the child trafficking charges against them. Jim Allen was one of the missionaries released last week. He joined us on Monday's American Morning, along with his attorney Hiram Sasser, to give us his side of the story. Editor's Note: Cady Coleman, Ph.D. is a NASA astronaut – a veteran of two space missions, who has logged over 500 hours in space. She is assigned to the Expedition 26 crew and is scheduled to fly to the International Space Station aboard the Russian Soyuz 25 in late 2010. This is part of our year-long American Morning original series, "Counting Down Cady." American astronaut Cady Coleman is getting ready for a six month stay aboard the International Space Station and we are getting an exclusive, behind-the-scenes look as she trains for the mission. Today, Cady brings us to Japan courtesy of her "Cady Cam." Broken Government: How to fix Congress? 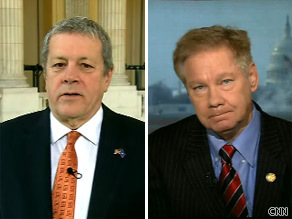 Rep. John Tanner and Tom Davis spoke with John Roberts on CNN's ''American Morning'' Monday. (CNN) - Gridlock. These days, many Americans feel that is all they are getting from their government. To examine the problem and potential solutions as part of CNN's special series "Broken Government," we spoke with two men who decided to get out of government entirely. Tom Davis served 14 years as a Republican congressman from Virginia. He retired in 2008 and is now the president of Main Street Advocacy. And Rep. John Tanner, a Democrat from Tennessee, announced his retirement in December after more than 20 years in office. They spoke with John Roberts on CNN's "American Morning" Monday. Below is an edited transcript of the interview. John Roberts: Congressman Tanner, let's start with you. Evan Bayh said last week, when he announced that he wasn’t going to stand for re-election, that Congress is not functioning as it should. Do you believe Congress is broken? John Tanner: I do, and I think it goes back really to 1962 in a case from Tennessee, Baker v. Karr, where the Supreme Court of the United States ruled every congressional district ... based on population, had to have approximately the same number of people. That has been refined, and now the gerrymandering that goes with that … that has gone all over the country. What it means is the most partisan elements of our society, those on the left and right who believe their party is right and the other guy is always wrong, are electing, to the best of our count, almost 350 members of the 435 members here in the House. And so people are responsive to the people that elect them, so you have the left and the right here, and there’s very little in the middle. Roberts: Congressman Davis, do you agree with that, that redistricting is the problem? We had a poll out last week, 63% of respondents think most members of Congress don’t deserve to be re-elected. Yet, on average, in an election, 90% of House members return. Tom Davis: 80% of the members come from districts where their race is their primary, it's not the general election. They don't get rewarded for compromising, they get punished if they compromise with the other side. By the way, the Voting Rights Act, [is] in concert with Baker v. Karr – because the Voting Rights Act … has made the districts even more partisan. The difficulty is a lot of these members’ races are in primary elections and not in generals. In primaries, you don't get rewarded for compromising with the other side, you get punished. A shocking new Senate report concludes the Diabetes drug Avandia is linked to tens of thousands of heart attacks, and its manufacturer, GlaxoSmithKline, knew about the risks for years and kept them from the public. That report is also highly critical of the Food and Drug Administration. Dr. Steven Nissen co-wrote a study at the Cleveland Clinic nearly three years ago tying Avandia to an increased risk of heart attack and death. He joined us on Monday's American Morning to discuss the report.